Jenny Rogneby is in top form with her latest international thriller, Any Means Necessary, the highly anticipated sequel to Leona: The Die Is Cast. Antihero, Leona Lindberg, the detective with the Violent Crimes Division of the Stockholm Police from the last book, is once again the star of the show. A man, Fred Sjöström, blows himself up outside the Parliament House in Stockholm, but miraculously survives. Was he a lone wolf? If not, are there more heinous acts to follow by terrorist cells hidden throughout the city? Much to her frustration and protestations, Leona is quickly put on the case by her new boss, Alexandra. She will be the main interrogator of the would-be bomber. This is the last thing Leona needs in her complicated and extremely dangerous life. She has barely escaped her trials from the last criminal case and is focused on other things, chiefly her son’s death, for which she blames herself; her addiction to gambling; a mountain of debt crushing her; plus she is living under the constant threat of death by local mobster, Armand, unless she can come up with the vast sum of money she owes him. It’s lucky then that she can think outside the box like no other detective. With one foot on each side of the law she establishes a modern day school for scoundrels, teaching villains the tools of her trade on how to avoid prison and be more successful in future careers against the police! Additionally, as an award, the cream of this motley gathering will go on to help her carry out one of the most audacious heists of all time. One of the villains enrolled in Leona’s crime classes for criminals is David Lind, and Leona soon finds herself attracted to him and his mysterious ways. Unfortunately for Leona, Lind is a police informer reporting back to his police handlers on the entire operation. On top of all this, Alexandra more or less orders Leona to seek therapy if she wants to continue in her role as a detective. After attending one session with therapist Aimi, Leona manages to sneak a peek at the report. It was anything but glowing, but admittedly close to the bone: Delusional. Psychopathic tendencies. Antisocial personality disorder. With time running out because of the possibility of another bomb exploding in the city, Sjöström starts giving crypt clues to Leona, as if he is aware of her darkest secrets. Will Leona be left with no other option than to kill Sjöström? 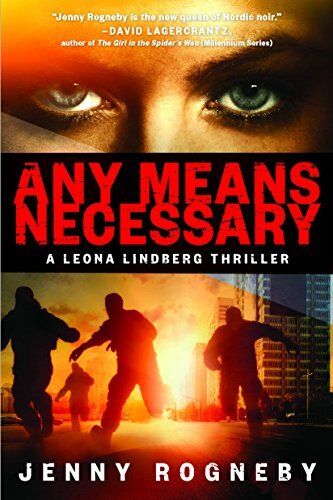 Any Means Necessary is a compelling modern day thriller with a brilliant twist. Rogneby utilises her vast knowledge as a criminologist in the Swedish Police Force to keep the reader guessing, right down to the very last explosive page.